Ben Norbury, Mat Stephenson, Lesley Norbury, Stephen Sladin, Lee Wood, Polly Wilding. The last act of the 2018 time trial season took place on Jan 27th 2019 at the Middlewich Masonic Hall. The Manchester and District Time Trial Association Awards Luncheon was attended by 21 members and friends of the club, there to support our award winners. Ben Norbury took the awards for Best All Rounder and Middle Distance All Rounder as well as the 12 hour championship ( Alex Rea Trophy)and silver medals in the 50 mile and 100 mile championships. Polly Wilding won the Ladies 12 hour championship (Edith Massey Trophy). These two, supported by Mat Stephenson, Stephen Sladin and Lee Wood also took the BAR team championship (ABC Centreville Shield), the 12 hour Championship Team ( LH Brooks Cup) and second place in the Middle Distance BAR team championships. Lesley Norbury was guest of honour and presented the prizes. The club group today were also the largest group amongst the 100 or so present at the awards ceremony. 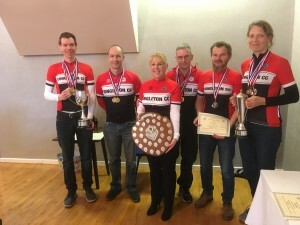 The club performances in Cheshire TT’s throughout the season also meant that the club was the best performing team in the 20 event Cheshire Points TT Series. Ben Norbury was the individual champion, and the club were top team. Polly Wilding was second lady behind Claire Harrison (Vision Racing), and in the 50 – 60 year old category Mat Stephenson and Stephen Sladin took second and third places behind Adrian Hughes of Seamons C.C. Now for 2019.